is moving ahead with the Premier Denis Napthine and Deputy Premier and Minister for State Development Peter Ryan announcing that global developers will be invited to submit formal expressions of interest to build the 3.3 hectare site. “Today we announce a unique opportunity to develop a fantastic precinct in the heart of the world’s most liveable city,” Dr Napthine said. Mr Ryan said the Coalition Government was proud to be developing a site which had been crying out for action for years. “The Federation Square East project can connect central Melbourne with its cultural, sporting, entertainment precincts and parklands. “Federation Square East is part of the Victorian Government’s policy to unlock under-utilised land along the rail corridor. Other potential projects currently being planned include E Gate and Richmond Station," said Mr Ryan. Located in the heart of the city, the site is bound by Federation Square and Russell Street to the West, Flinders Street to the north, Batman Avenue to the East and Birrarung Marr to the South. 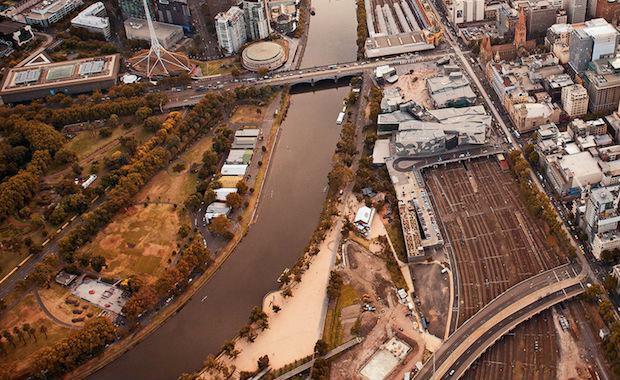 This city shaping redevelopment is set to revitalize the north bank of the Yarra River, better connecting the CBD with the cities famous cultural, sporting and entertainment precincts. This development presents itself as an exciting opportunity to create a vibrant, mixed use development in the world’s most liveable city. Approximately 2.3 hectares of the site is above rail yards and one hectare is currently largely used for car parking. It is estimated that it would cost $350 million alone just to deck over the rail lines, suggesting a multi-billion dollar developer would have to take on the mammoth job. said although the development would be market led, the Government expected strong benefits for the public from the project. “Federation Square East is a once in a lifetime location on the doorstep to our city,” Mr Hodgett said. “It will link the river with the CBD, complimenting Federation Square and adding another iconic Melbourne landmark for all to enjoy. “This project is part of the Coalition Government’s vision to invigorate the rail corridor, linking the river and sporting precinct to the CBD, and helping keep Melbourne the world’s most liveable city. “Concepts should respect and enhance the Federation Square, Birrarung Marr and the north bank of the river and ensure they will not be adversely affected. Within walking distance to all Melbourne’s major landmarks and precincts, and with direct access to public transport and freeway connections, the site is undeniably prime real estate. The Victorian Government will officially release an Expression of Interest for the Federation Square East site on Monday, September 15.